If you use raspberry pi regulargly, you may have already needed to use the graphical interface of the raspberry pi without having monitor available. It is a classic problem, and always annoying. 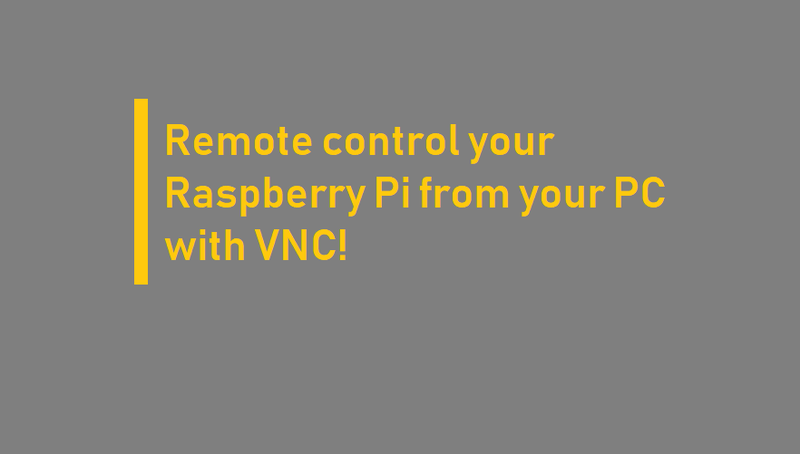 Today we will see how to use VNC to control your raspberry pi from another computer, so you can use your raspberry pi without screen! For schools and individuals that need to use the full desktop for certain applications (Scratch, creating your own graphical interface, etc. ), using a VNC client to access your Raspberry Pi might be the way to go. When using VNC, two different parts of the software are used. The first part is the VNC server. This one is installed on the machine we want to take control of (here the raspberry pi), and it will allow the connection and the control by the client part. The second part is therefore the VNC client. It is installed on the machine from which you wish to control the server and it will allow to translate your actions into operations comprehensible by the server which will then control the remote machine from your computer. Once you connect SSH to raspberry pi, we will be able to activate the VNC server which is installed by default on Raspbian. you just need to run the command sudo raspi-config, select the line Interfacing Options, then line VNC, and finally answer that you want to enable VNC. By default, pi uses the RealVNC server, which is configured to use a login mode based on user accounts on the machine. The only problem is that this connection method is not supported by all VNC clients. We will have to install a compatible client, the RealVNC client. To install the RealVNC client on your computer, go to the official download page of RealVNC Viewer, download and install the version corresponding to your operating system. Once you have installed RealVNC viewer, you only have to launch it and connect to the IP address of the Raspberry Pi, the default identifiers are those of the account pi. You are now connected to the Raspberry Pi, and you can control it, with its interface, from your computer!